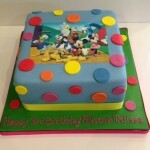 Minnie and Mickey Mouse birthday cakes are some of my favourites. I think I’m a bit old school and so always appreciate a bit of my childhood reoccurring in cake form. 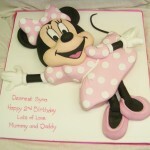 Mickey and Minnie children’s birthday cakes can be made in a number of ways from sugar models to 2D heads to 3D extravaganzas. 3D cakes always feed a minimum of 25 people so if you have fewer guests at the party, a sugar model or a 2D head are good alternatives. 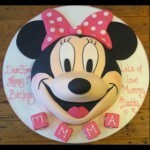 If you would like a personalised Mickey or Minnie Mouse birthday cake then get in touch! We’d be more than happy to hear your ideas and can customise your birthday cake in any way you like from the colours, theme to a range of scrummy sponge and filling flavours. 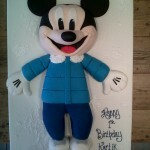 We can also offer gluten free Mickey Mouse cakes if your little one or any party guests have an allergy. We’re based in Southfields, Wimbledon and just a short stroll from the tube station so come on in and sample our cakes in our tea shop while you choose your cake. See you soon!